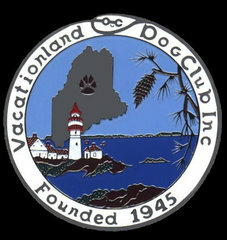 2000-1 A Vacationland Dog Club ("VDC") member, to be in good standing, must have their dues paid for the year, must have attended at least four (4) regular club meetings in that year and must have volunteered in some capacity at a club function. 2000-2 A member must be a VDC member for at least one year before having the privilege of advertising in the Federation of Maine Dog Clubs Breeders' Directory. 2000-3 Any member whose dues remain unpaid as of April 1st will no longer be considered a member in good standing with the club and will not receive the benefits of membership. 2000-4 Any officer or board member who is absent for three (3) consecutive board or regular meetings in a row without notifying a member of the board shall be removed from their position as an officer or board member. 2000-5 Members Puppy Sweepstakes (inception 1976). At least 5 entries are required in the Junior Class before awarding prize money. At least 5 entries are required in the Senior Class before awarding prize money. 2000-6 A new club member may note vote at the club's annual meeting for officers unless accepted into membership at or prior to the September meeting. 2000-7 A club member who has a check returned unpaid to the club in 30 days or who, after written notification by the treasurer owes money to the club after 30 days, will no longer be considered in good standing. 2000-8 No club member's expense, authorized by the board, will be reimbursed without proper receipts to the treasurer. 2000-9 The treasurer's books should be audited after the June board meeting. The audit should be completed by the regular membership meeting in September. 2000-10 VDC will hold a free lobster banquet for the members after the May shows to be covered by the vendors'proceeds of at least $500 (06-07-06). © Vacationland Dog Club. All Rights Reserved. Web site by The Salty Sheepdog Baa & Grille. Questions? Contact the Webmaster.